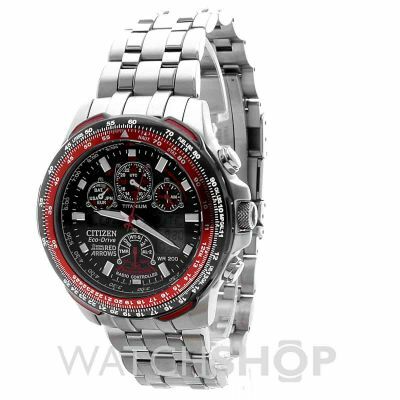 Citizen Skyhawk A-T Red Arrows JY0110-55E to przede wszystkim niezwykle interesujący zegarek męski. Zegarek wyposażony jest, między innymi, w chronograf (stoper) i funkcję daty oraz alarm (budzik). Tworzywo, z którego wykonana jest koperta to tytan, a czarny kolor tarczy nadaje zegarkowi jeszcze większego charakteru. Ten model posiada 200 metrową wodoodporność - oznacza to iż można używać go pod wodą podczas nurkowania (poza głębokimi morzami). Excellent watch, cant fault it. Ive been an airline pilot for over 10 years and Ive never had a watch as good as the Citizen Skyhawk A-T. It looks stunning with its lightweight titanium bracelet, sophisticated dials and striking red accents, my colleagues on the flight deck cant help but ask about it every time. Its a marvellous dedication to the Royal Air Force Aerobatic Team the Red Arrows. It features the Squadron crest on the reverse side making this timepiece very special indeed. The looks inspire dedication, precision and professional excellence but Im equally impressed by the Skyhawks engineering. Time is kept by automatic radio updating. Its so accurate that when compared the to the clocks on a Boeing 777 the Skyhawk and the aircraft clocks were perfectly synchronised. In two moves I can easily switch to any time zone in the world and know that the time keeping accuracy is being maintained. The watch is charged by being exposed to a light source, any light source. Out of the box the charge was low but all functions were operating normally and energy saving mode was not required. After two consecutive nights under a side lamp and one sunny day the watch reached full charge. The Skyhawk requires some basic setup before use. You will need to obtain a radio signal and you will have to verify that the watch hands are correctly calibrated. If you carefully follow the procedural steps in the manual the setup process would take between 10 and 30 minutes depending on radio signal strength at your location. There is a fully functioning analog flight computer on the bezel of the watch. If youre not familiar with whizz wheels as pilots call them, it looks complicated but its actually very easy to use after a bit of practice. The manual instructions are very good at demonstrating the capabilities of the flight computer. I have done some speed, distance, time calculations just to try it out and the watch gave me surprisingly accurate information when compared with actual flight data. If I was very critical I would say that the luminosity of the watch hands and hour markers at night are disappointing. If you were in a completely dark room you might not be able to read your watch until your eyes had adjusted properly. To make up for it though the digital displays can be lit up like afterburners with a beautiful orange glow that is easily seen. Its water resistant down to 200m, something that adds to the Skyhawks reliability. I thought that the price was more than fair, its more affordable than some competing brands but just as capable if not more so. If you like a watch that embodies precision and professionalism whilst being noticeable but not loud, a watch that is elegant and complexed yet purposeful and practical then the Citizen Skyhawk A-T Red Arrow could be a great investment for you. I bought this watch for my boyfriend who is addicted to expensive looking watches, it is an outstanding looking watch and now when not on his wrist, takes pride of place in his watch storage box, glass topped of course so they can still be admired. The large face, detail and the red on the watch make it stand out a mile, but not in a bling way, it looks very sophisticated for a man of discerning taste. The feel and fit if it, Im told, are very comfortable and although it looks like it is extremely heavy, given all the detail, it is not, just the right weight to know you are wearing a quality watch. Beautiful. This is a really nice watch, I havent gone thought it very comprehensive manual as yet. This a eco watch that never needs a battery and is also radio controlled which adjust the time and therefore its always correct. Top watch. great watch, highest quality and superb finish. Great watch , like it a lot!!! This was bought as a 60th Birthday present and hasnt been given yet another two weeks to go. However I was extremely happy with the service received - it was ready for collection day after ordering - and emails updating me of the status etc. It is a lovely watch and the person who will receive it has been looking at it for a while. Beautifully presented in a lovely gift box and of course it is Citizen and this will be an addition to a Citizen collection for both myself and my other half. I have been told that when the gift has been received and it needs either links taking out or adding this will be done free of charge. So while I cant comment at the moment on the watch itself everything else is excellent and I will definitely use watchshop again and indeed recommend it to friends and family. Thank you and if you want me to review the watch itself please ask again after 20th December and I will be more than happy to to this. Very pleased with this watch, its very detailed and even the presentation box is amazing , but as this is a christmas gift for my husband he hasnt been able to try it on, its even over £100 cheaper than any other place that I have looked and its next day delivery, I know my husband will love this watch, so a big thankyou watchshop. Email to add to my collection. It is not always general practice to write a lenghy review, but I feel that in this case it would be appropriate. I have purchased the Citizen Skyhawk Red Arrows Limited Edition Titanium Model: JY0110-55E watch from The Watch Shop a few days prior. I wrote The Watch Shop and they replied within a few hours that ’ Customs Duty’ would not be an issue because Belgium and The UK are both within the EU, and the price does not contain any hidden taxes. I received the BEST PRICE OFFER for this watch within the European Union from The Watch Shop, NO OTHER COMPANY BOTH IN THE UK OR GERMANY COULD MATCH THEIR PRICE. They gave me COMPLIMENTARY DHL SHIPPING BECAUSE it was an expensive watch, and with EXPRESS DHL the watch would arrive: upon payment, the next day – less than 24 hours from The UK to Brussels, Insured for damages and tracked by DHL. I decided to purchase the watch from them, and an hour later I received a Security Clearance Request, meaning I needed to prove that I had made the purchase for myself, since my Home address to where I requested the shipment differed from that of the Credit Card My Office address, this proved to me that they are extremelley professional people! I sent them an email to verify and called them TOLL FREE from Belgium to The UK. The Security Clearance was given and half an hour later, I received a confirmation of acceptance of International Payment. An Hour later, DHL SMS - ed me to inform that a package, still in the UK, would be delivered to my address the next day! The Watch Shop had contacted DHL and set up my delivery. I had nothing to worry about from my side. Then I received an email with the DHL Tracking number and also a ’STATUS UPDATE PAGE’ form the WATCH SHOP aswell as DHL, to be able to track my Watch hour by hour, from the time of my purchase to the point it reached me. Needless to say The Citizen Skyhawk Red Arrows Limited Edition Titanium arrived at 9:57 am the next morning via DHL, perfectly packed and insured from The UK to Belgium! 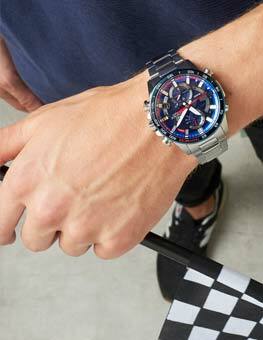 I received the best price for this watch, in Europe and my purchase went extremelley smoothly, I would dare to say, even smoother than walking into a shop to purchase it myself. 1.The links were removed as requested by me, to fit my wrist size. 2.The watch was set perfectly for me in advance, it is an extremely complicated Pilot’s watch, which saved me hours of setting it up. 3. 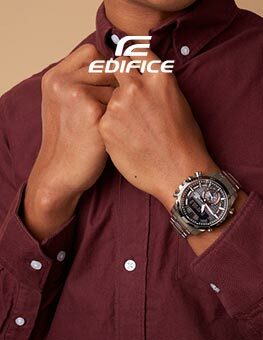 Since it is an Eco-Drive Watch it depends on light, artificial and natural light as its powersource, and being in a box one would expect it to be depleted, yet it is over three-quarters charged full, giving me over 120 days of power reserve. 4. Not only is it guaranteed for 5 years, I received an extra year if I register making it 6 years of 100% guarantee on this watch. I know about watches and own a few, and believe me The Watch Shop is probably one of the best companies I have ever purchased from! I will use them for all future purchases for myself and family members, I will tell my friend about them. Also their selection is very broad, they carry a lot of models that are hard to find elsewhere. I am gleaming since I received this watch, the watch itself is amazing, The colours are perfect and the tone of the Titanium is top notch, the Sapphire Crystal Glass is 9 out of 10 on the Mineral Hardness Scale, where Diamonds are 10/10. The watch is very light and easy on the hands, it is Radio Controlled meaning it sets itself via a Radio Tower in Germany, near Frankfurt, for Europe at 2 am each night and has perfect time based on UTC time, but even if the Radio tower is out of range it skips 1-2 seconds per year, that’s amazing! 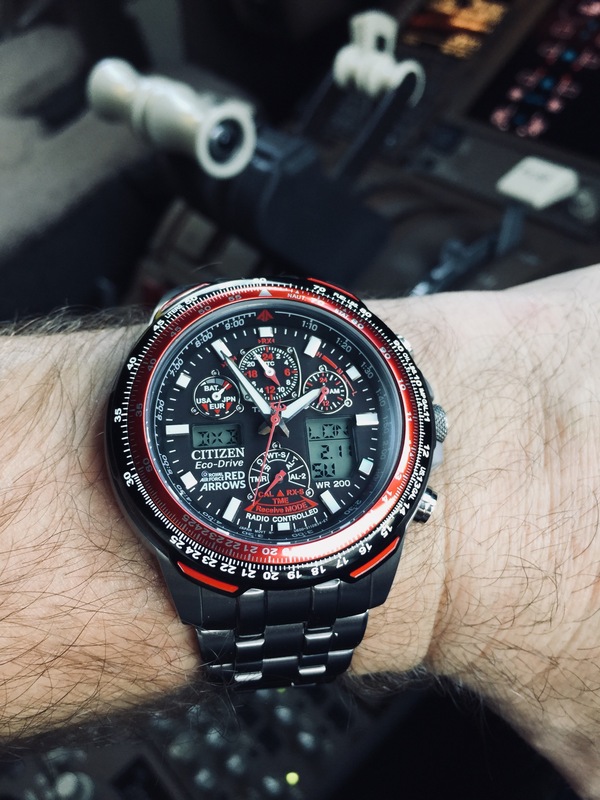 Bottom line: I have included Screen shots of my DHL Status, The Citizen Skyhawk Red Arrows Limited Edition Titanium to prove that every word I have written in this review is true. The Watch Company is top-notch, The people who work there are professionals, their products are the best in the market and buying from them is hassle free. My Satisfaction for this purchase made is 100% hands down! Thank You The Watch Shop! Great Work! Great service from Watchshop chose to click and collect from Goldsmiths who adjusted the bracelet as well. Citizen Red Arrows Titanium watch so much lighter than the equivalent Stainless Steel version. Really pleased with it and the servicd from Watchshop. Saved well over £150 pounds. I bought this for my fiance, his comment is that its an amazing watch and so light in weight. The best present he has ever had, his words!! A good fitting, lightweight watch and one of the best watches I have ever had. Every detail of it is superb. Very quick delivery well protected in the packaging. The watch is fantastic looks very good on the wrist. Great build quality the auto time zone saves hassle. Highly recommended. An excellent purchase of a quality watch, easily made through Watchshops helpful website. The opportunity to have the watch gift wrapped at a very reasonable price was much appreciated and added much to the excitement when received by my son on his 50th birrhdat. The look of the watch is outstanding and I highly recommend paying the extra for the titanium case and bracelet. Its so light and extremely comfortable. On the downside the back light is pretty much useless to read the digital display. The inner dials are too small to read. The slide rule bezel could do with an anti-glare finish to be able to use it with ease. I am disappointed that to view the current date you have to pull out the crown and turn it to cal mode. Although you can leave it in this setting it does make the time zone function defunct as if you then need to view the time in another country you will have to pull out the crown an set it to time, thus resulting in the loss of the date in the display. Surely this feature could have been easily addressed by pressing one the buttons? The digital display could have been made bigger to make viewing easier. As for features there really isnt that many that can be obtained from other watches as standard stop watch, timer, alarm, multi timezone. I do like the ecodrive technology and the automatic time keeping. Ive calibrated the the time using the radio control feature and can honestly say it doesnt take nowhere near the 15mins estimate some reviews say. Usually about 1 - 2 mins. Overall a good looking watch that could have been an excellent watch with just a bit more attention to detail on ease of use for the wearer. I had been wanting a skyhawk red arrows chronograph for quite a while but the price is very high then they were not being displade in my local shops I was told they had none left which was a real disappointment for me out of desperation I looked on the internet and watch shop had the exact one I wanted,\r\nGreat watch and easy to buy. This has been bought as a pressie for my husband to be. It is a beautiful watch. Absolutely lovely watch, just what my husband wanted. A watch that I have had my eye on for a while and now I finally own it! As soon as you hold the watch you feel that quality youd come to expect from Citizen. The titanium strong and desirable, and although being light weight it doesnt take away from the solid feel of the watch. The bezel is a nice touch and ideal for pub talk I am not a pilot so thats as much use as thatll get with its fuel gauge, however I feel this is the only part of the watch i am not so fond of, not because of the looks but because it just spins freely and does not click round. A small detail but thought Id mention it never the less. The colour of the watch is what struck me, it stands out but remains subtle as to not be in your face, and the relatively busy face, which I love has a lot of features. I love accents of hints of the red arrows from the name in the lower left of the face of the watch, and the badge on the rear case. The watch in standard form I needed a few links removing, and i have fairly large wrists. Overall a cracking looking watch, which is lovely to wear and ideal for any aviation enthusiast like myself. Excellent watch, I have wanted one for a while and finally took the plunge. Really glad I did, the watch looks a lot better in real life than in pictures. This is a great watch. It is the second A/T watch from Citizen and the first with world time option.It was ready to wear within 30 mins of opening the box, the instructions are very clear but must be read through completely for each action before you start to set anything? ?.The two digital windows for home/other zones are easy to read and the leds for the dark are a good addition. looks bulky but titanium is very light the silver,red and black make a good looking watch as well. The wrist band I found the best so far to fit well as it has better adjustment increments than any others I have owned. Overall I find no cons with this match and would not hesitate to recommend it to anyone. Purchased red arrows from watch shop, excellent service and liked the product.The good points: Looks amazing, heavy but comfortable, radio reception gives to-the-second accuracy, timer, stopwatch, alarms, world time, backlight - all the usual stuff.The price is on the high side but for what you get, it is incredible value for money. looks amazing on the wrist. The watch was brought for my partner as a birthday present, he loves it, it has taken him a few hours to read the manual on how it works, but hes sussed it now. The watch is beautifully made and looks lovely. At the moment we are trying to find somewhere local to get the strap adjusted to fit his arm as it is far too big. An excellent watch could not be happier with this purchase bought at a competitive price, service was first rate and with 0% interest free for 12 months all the better. Lovely stylish looking watch, bought after attending the Farnbourgh air show. With red arrows 50th year celebrations. Bought for my man who absolutely loves it, hes so proud wearing it . It light and comfortable on his wrist, had to have one link removed for a good fit cost a fiver. It came in a lovely red arrow box with all instructions . Very pleased with the product . Most men appreciate clockwork convenience, accuracy and reliability. This has it all, and in addition is elegant. I bought myself for my birthday. Great watch and agree with all the comments about quality, style, weight, etc.but do fault the date display. The date shown is that of the alternate time zone rather than the current selected zone. Not a major problem if the alternate zone is Paris or Berlin as it just means the date changes one hour from midnight. Could be misleading in more distant time zones though. A note on the reviewer who had a jeweller who commented that the bracelet pins were loose. This sounds like the jeweller made a mistake. There are tiny little slings holding the pins in place which out when the pins are pushed out. They are smaller than a pin head and I only realised they existed when the refitted pins were loose. I still have two somewhere on the floor but fortunately when the bracelet is shortened there are some spares available. 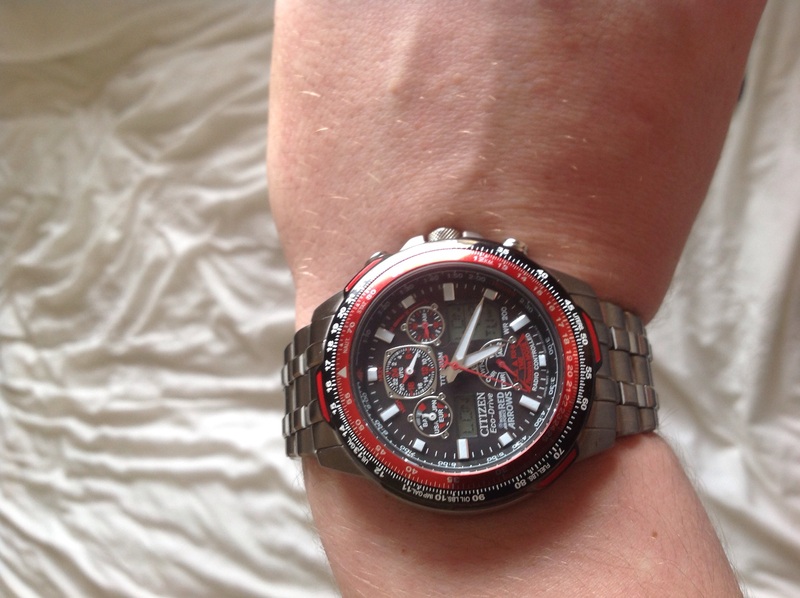 Citizen JP0110-55E Red Arrows perpetual watch. The watch looks fantastic. Its very impressive with the red chrono ring against the black face and dials. The dials are very small and are difficult to read precisly, but will give enough information once you adjust to know what information they are conveying. My previous watch was from the Citizen Diver range and featured a double lock clasp which the Red Arrows watch doesnt have. This is not a major issue, but does give an added level of security! So I wanted this watch for quite some time and finally treated myself. Ive had the watch for a couple of months and can give honest feedback. The watch looks and feels great on. I had to remove a couple of links for the perfect fit but a local jeweller did this for a tenner. Operationally, I find the digital display element of this watch way too small. I wear glasses however and this may be down to that. The backlight on this watch can only be described as poor. A weak orange glow that does nothing to improve viewing digital display in low light conditions. Luckily the analogue hands are luminescent which just about makes up for the poor backlight - but not always.The watch is incredibly light in weight, considering the size. A bit complicated to use at first, but this is a minor gripe really. I like the fact that I have to do nothing at all with it as it keeps perfect atomic clock time and the battery is charged by the sun.Im really glad I treated myself to this watch as It feels quality and in my opinion looks great. Im comfortable wearing it for business and quite equally in casual or more formal occasions. I like the flash of red in the design of the watch. Initially I thought he watch very large. 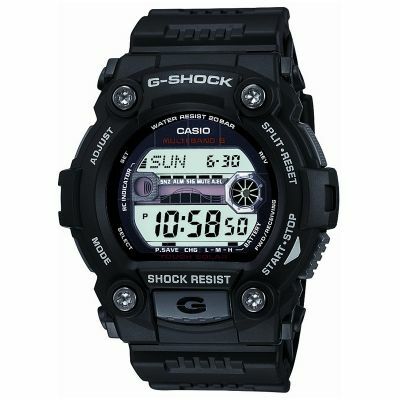 I was used to wearing a Gshock watch, which isnt a tiny watch but my sky hawk felt a lot larger. It didnt take long for this perception to pass however. Overall Im very pleased with my watch, it would have been happier with better backlighting but hey, I can live with it. Would I recommend this watch? Absolutely. The light weight titanium, comfortable day to day reliability of my sky hawk was worth the price. It was a toss up between this watch and the tissot t touch titanium. They have differing functions but what swung it was the look. The Eco drive will run forever as it is powered by the sun, never needs the time changed, causes it is radio controlled and it has timer, chrono, loads of time zones and all sorts of pilot stuff on the bezel. The titanium casing and strap is amazing, so so light it feels like you are not wearing it at all. Not to mention the fact that it looks amazing on the wrist! This is my second purchase from the watchshop, cant fault the service in any way. Delighted with the Skyhawk AT both in looks and function. Having been an advocate of mechanical watches for many years, Im a convert to the Eco Drive and will be looking for the next purchase before to long. watch is perfect delivery was quick everything is perfect. finance option has worked really well for me. I bought this item for my husbands 40th birthday! He loves its style, colour and uniqueness! 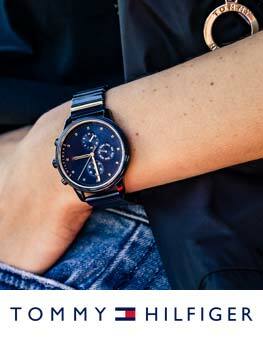 With its black & red face and titanium strap its very stylish also! Although it was expensive i do think it was worth its money! Just the job, very happy with the watch.it lives up to all my expectations.not easy to first set up, it when done everything is good. A great watch and quality shines through. Great for enthusiasts wanting all the features as well as people just wanting a great looking watch. What you cant tell from the site is how light it is. Really comfortable on the wrist and very striking, Ive had lots of compliments. You wont be disappointed.. I bought this watch for my wonderful husband because I think perfect for him and this Christmas that a perfect gift to give. One word perfect! A lot lighter than expected, really comfortable and looks great. Bought as a present for my wife, she adores it ! My only regret is that I didnt buy it for myself. A first class watch - Highly recommended. Even better looking in real life than on the screen. Great looking watch, much lighter to wear than it looks. The red colour is very striking. Very satisfied. The watch is just as described and and looks much better in person. having the different time zones on the watch is perfect for my husband who is a frequent traveller for work. The watch looks much better in person and he has had a lot of positive comments. We are very pleased with the watch and would recommend it. 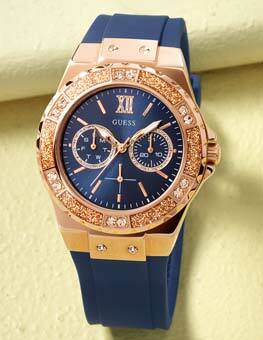 Super watch, lightweight stunning looks. I like the watch most because it has accurate time keeping, and I dont have to worry about re-newing batteries. The only fault is the tiny lettering, I wear glasses but still cannot see some of the words. I have not yet tried the alarm but what I have read it isnt too difficult.